I took advantage of brilliant sunshine and warmer temps today, to join the merry throngs of holiday shoppers. Needing to complete my Christmas shopping, it was a necessity, and I don’t mind the crowds. Greg accompanied me, offering his services as chauffeur and package carrier. We made a day of it, grabbing lunch and visiting a variety of shops, as I crossed items off my shopping list. One of my stops was purely out of curiosity. 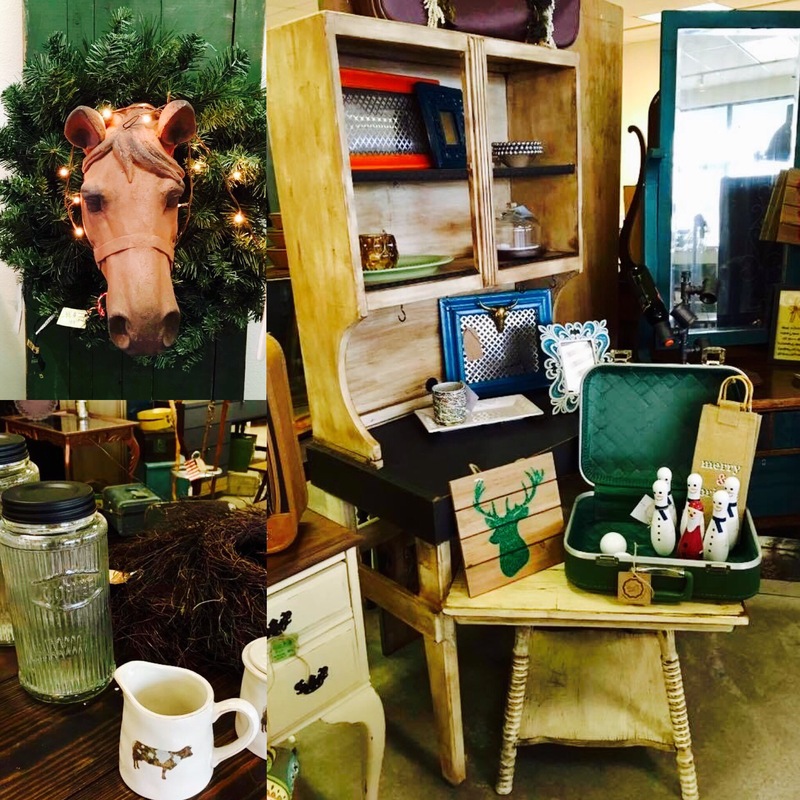 Miss Daisy’s Attic is a vintage boutique offering an interesting mix of antiques, repurposed items and hand crafted pieces. The shop opened in mid October and I’ve been wanting to stop by. Located near Cracker Barrel Restaurant, at 2702 Richard Joseph Blvd, I was intentional about adding Miss Daisy’s to my list of shops to visit. What a beautifully arranged store. 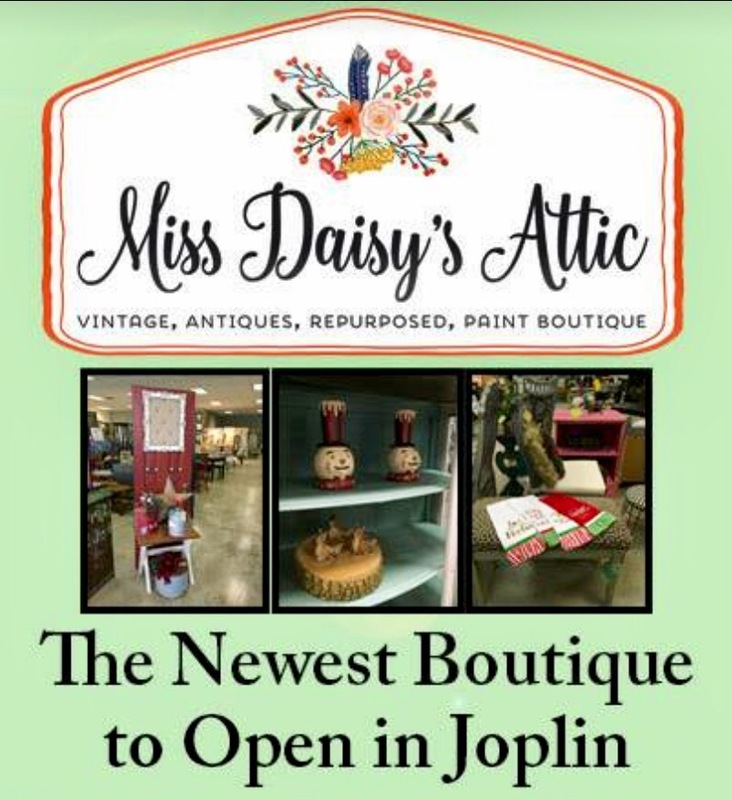 Miss Daisy’s Attic has the charming look of a boutique, rather than a flea market. The displays were well merchandised and appealing. I enjoyed a leisurely stroll through the store, seeing many interesting items. I will visit again, after Christmas, and shop for myself. However, one piece caught my eye this afternoon and I couldn’t leave without it. This vintage Santa pitcher, made by the Japanese company TILSO, was made in the 1960s. 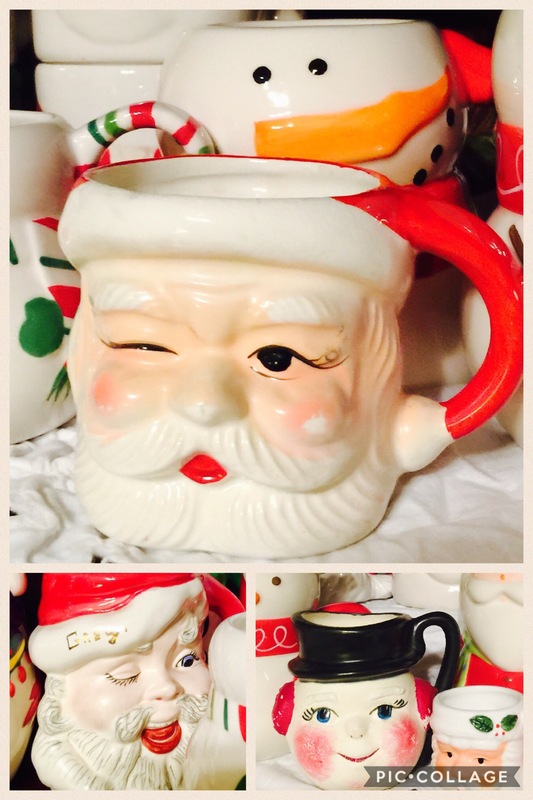 I have a large Santa mug collection, that I display every year, and I’ve never seen this pitcher in a store before. It is a perfect addition to my collection. Greg’s mother unknowingly started my collection in 1977, when she gave me the three mugs pictured above. 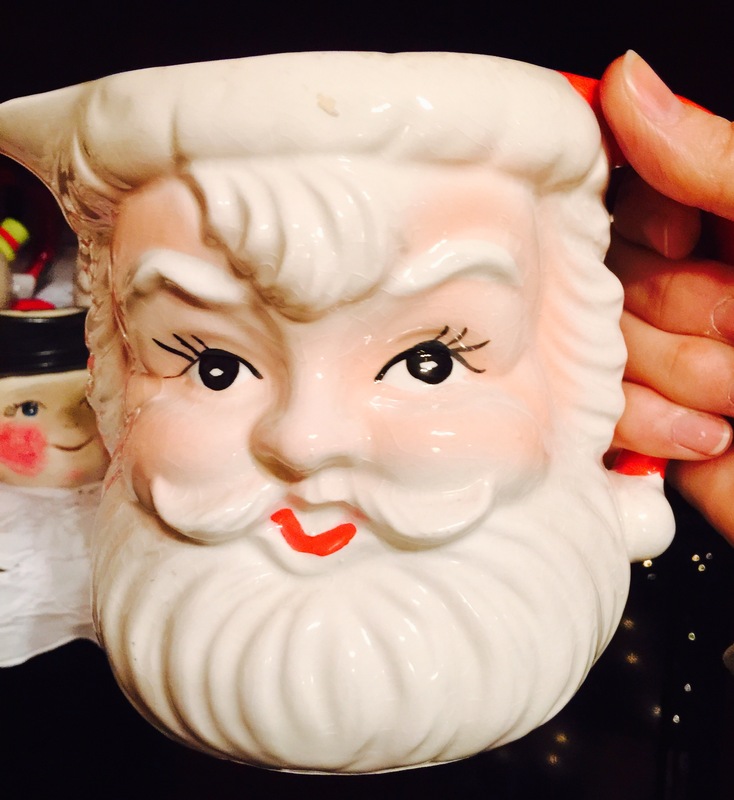 The winking Santa mug, which is another TILSO piece, was purchased in the 60s. She made the snowman mug and the Santa one in her pottery classes, sometime in the early 60s. Greg’s name is painted in gold on Santa’s stocking cap. 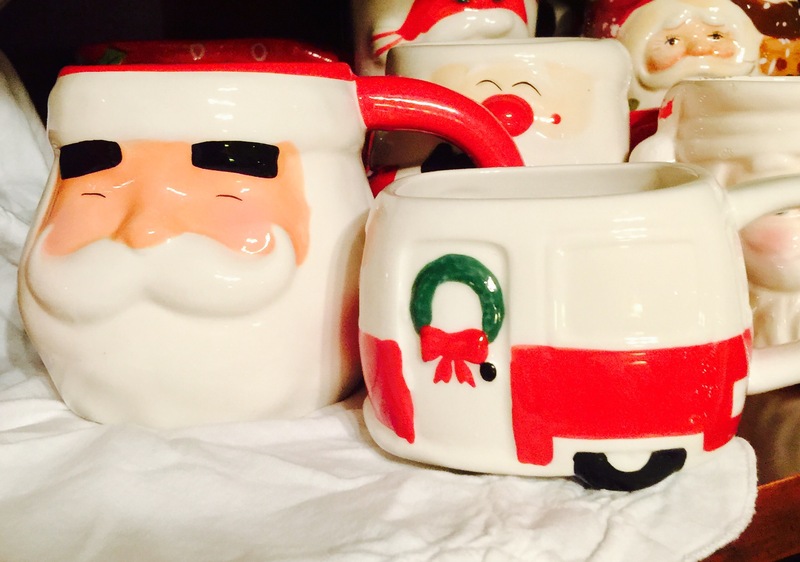 This year’s mugs…the “bushy eyebrows” Santa and the motor home mugs, purchased at Target. I have been adding to my collection each year. 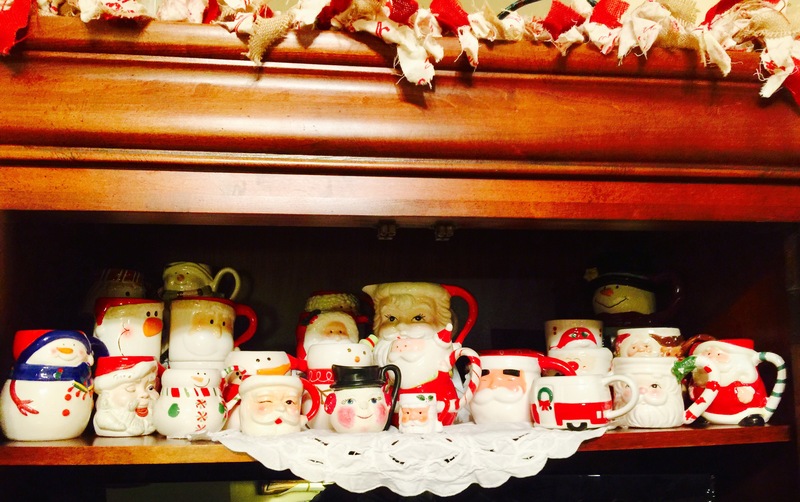 Most of the mugs are representations of Santa, as I stay true to the pieces that started this tradition. However, there are also snowmen mugs, a snow angel and a shepherd among the group as well. If there is not a sticker affixed to the bottom of the mug, with the date and store name on it, I write that info on a strip of paper and drop it into the cup. I enjoy my mug collection. It is festive and cheerful and a connection to my late mother-in-law. As I continue to add new mugs, I will have to find a new location for displaying them, or split the collection into smaller groupings. I am delighted with my find today at Miss Daisy’s Attic. The pitcher looks great perched in the midst of the assortment of mugs. Greg’s mom is surely looking on with amusement, or astonishment, at what has grown from those first mugs that she gifted me with. 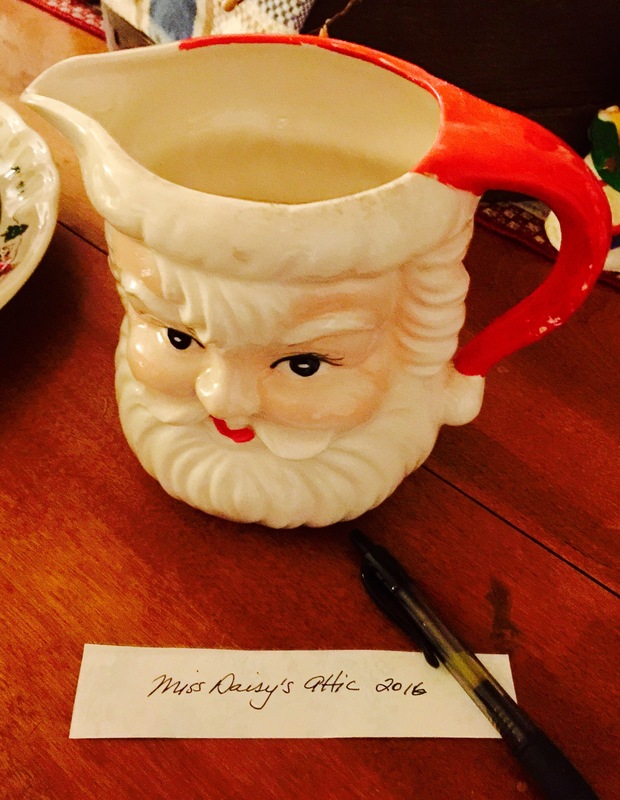 Merry Christmas to me…from Miss Daisy’s Attic! I have looked forward to seeing this movie since previews aired late this summer at the movie theater. The storyline intrigued me and the tag line…We are all connected…caught my interest as well. This afternoon I took time to slip away and enjoy watching this thought provoking movie. 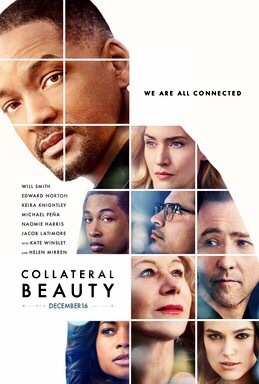 Collateral Beauty stars Will Smith, Edward Norton, Helen Mirren, Kate Winslet, Kiera Knightly, Michael Peña, Jacob Latimore and Naomie Harris. This drama was directed by David Frankel and carries a PG-13 rating for brief strong language. The movie has a run time of 1 hour and 37 minutes. Howard (Smith) is a successful executive with a NYC advertising agency, whose life takes a tragic turn. His young daughter dies. Life becomes too much to bear. He withdraws from his business partners and friends, Whit (Norton), Claire (Winslet) and Simon (Peña), and from life itself. As the company he helped to build loses momentum and is threatened with ruin, Howard flings out painful questions to the universe. He writes letters to Love (Knightly), Time (Latimore) and Death (Mirren). Unexpectedly, Howard meets each entity and begins to learn about the connectedness of all people and all things. He opens up a tiny bit, to a grief counselor named Madeleine (Harris), who helps parents after the loss of a child. Madeleine has journeyed through that heartbreaking and life changing experience herself. She believes Howard, when he shares that Love, Time and Death are having conversations with him. And she shares that as her daughter was dying, a woman she had never met before encouraged her to look for the collateral beauty. In the midst of these impossible encounters with otherworldly beings, and difficult but healing conversations with Madeleine, Howard discovers his business partners are doing whatever it takes to save the company, even if they must oppose him. Each of his partners, his friends, have challenges of their own to deal with. All of their lives are impacted by Love, Time and Death. This was an amazing and poignant story, full of sorrow, humor and hope. 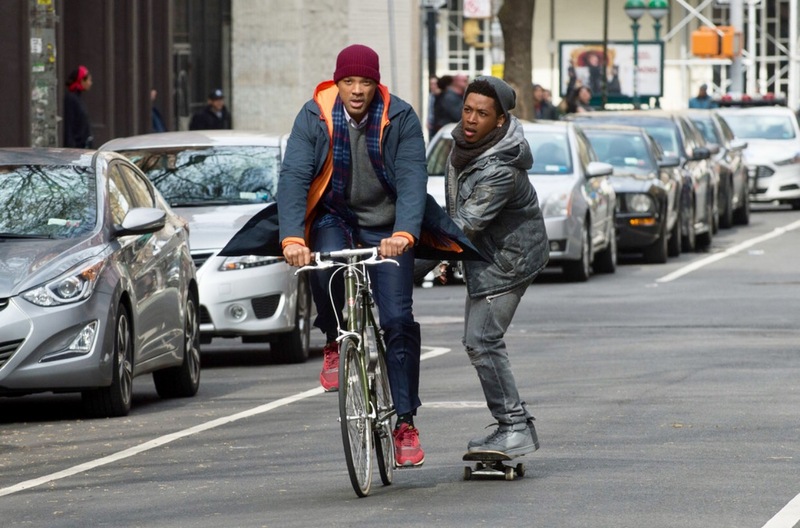 Will Smith’s character references Love, Time and Death at the beginning of the film, before tragedy befell him. He says, “We’re here to connect. Love, time, death. Now these three things connect every single human being on earth. We long for love, we wish we had more time, and we fear death.” These three have much to say, to Howard, to his friends, to the audience, watching this story unfold. While I have, gratefully, been spared the loss that Howard suffered, I am no stranger to angst nor to throwing out questions that seem unanswerable. We have all been in that position. The whys, the what ifs, they have peppered our journeys, and kept us chained to past events, kept us from moving forward, prevented us from seeing the collateral beauty. This movie was painful to watch at times, and yet, I wanted to see Howard’s questions answered. In hearing responses to his pain, I could access my own. The collateral beauty aspect was thought provoking. 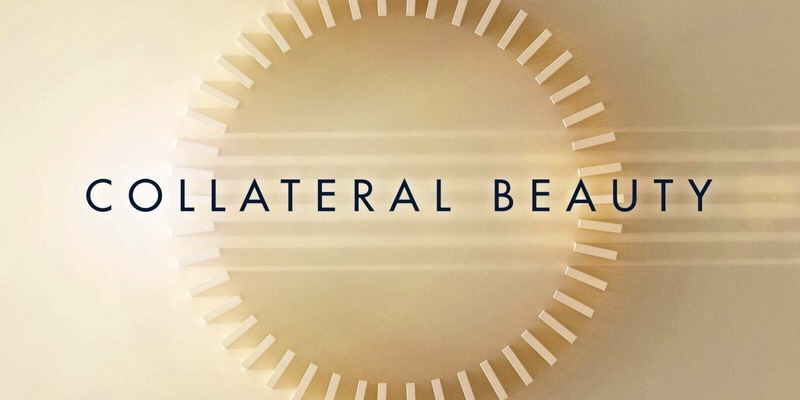 I know from experience that from my most difficult times has come growth and revelation and awareness…all forms of collateral beauty. It is possible, even after the unimaginable happens, to see the beauty that exists around us, and see in that beauty, the wonder, the connectedness of all things. That beauty helps us to remember that we are part of a larger story that is unfolding. This was an extremely well done movie. There were twists and turns and a big reveal near the end that made me smile through tears and appreciate the cleverness of the writers. I adore cleverness. 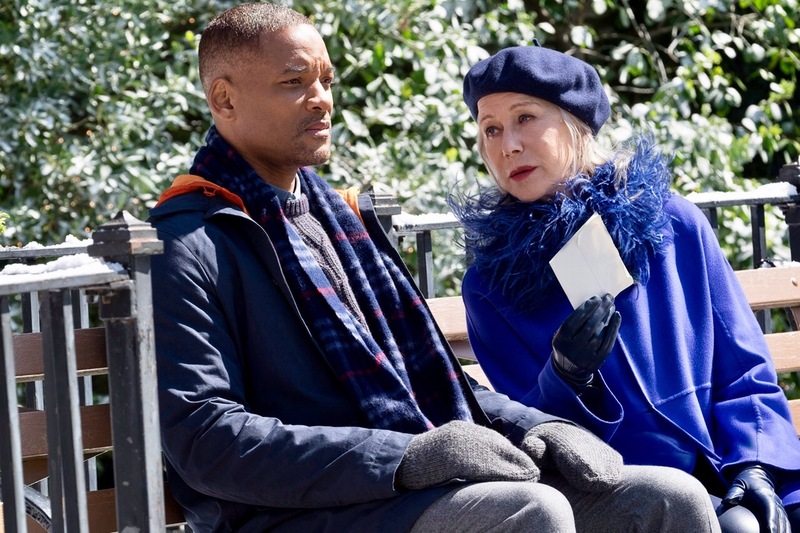 And Collateral Beauty, along with many worthy traits, is certainly clever. And haunting. And beautiful. I’ll be thinking about this film for days to come. Today the last two members of my family both celebrated birthdays. Among my large family, this is the only occurrence of shared birthdays, and interestingly, they happened at the end of the year, creating a big finish. So I can focus on each person, I’m writing two blog posts today. This is my grandson Oliver’s birthday post. 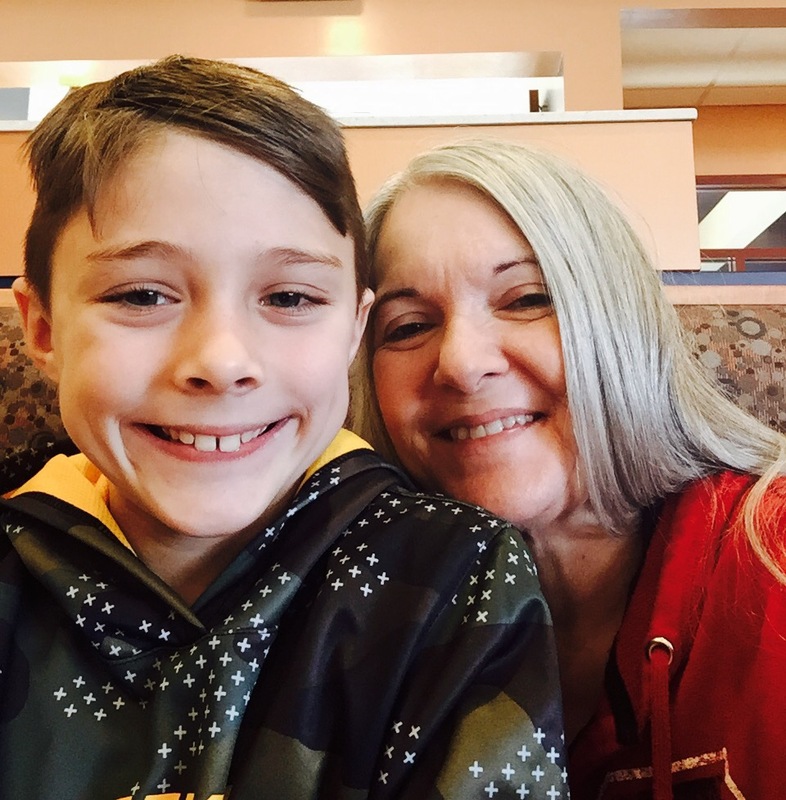 After winter weather moved in yesterday, I was unsure whether Oliver and I would get to enjoy our birthday lunch and shopping trip today. Although the sun was bright, helping to clear the roads of their icy layer, the temperature never rose above 14 degrees. My son and daughter-in-law and I discussed the situation via text messaging, and agreed the roads were safe. The birthday outing was on! Before meeting Megan in Joplin, to pick up Oliver, I looked up his name. “Oliver, you are learning to develop patience, and discovering that perseverance is a trait worth cultivating. You are good at absorbing knowledge and retain it well. While you can be charming or play it cool, most often you are a mixture of both. People don’t realize that you tend to hold things inside and suffer in silence until you can’t remain silent any longer, then you may express yourself strongly. You desire to inspire and lead, to control what others do. You are giving, courageous and bold, action oriented, energetic and strong willed. You truly want to make a difference in the world, and this attitude draws you to cultural interests, politics, social issues, and the cultivation of your creative talents. I see the truth in these words about this handsome, active boy, who turned nine today. Patience hasn’t been a word I have associated with Oliver. And yet…I have seen this child grow and change so much this past year. He is learning that sometimes you go after what you want. And sometimes, you wait and the perfect opportunity arises. He is incredibly bright, remembering well what he learns. 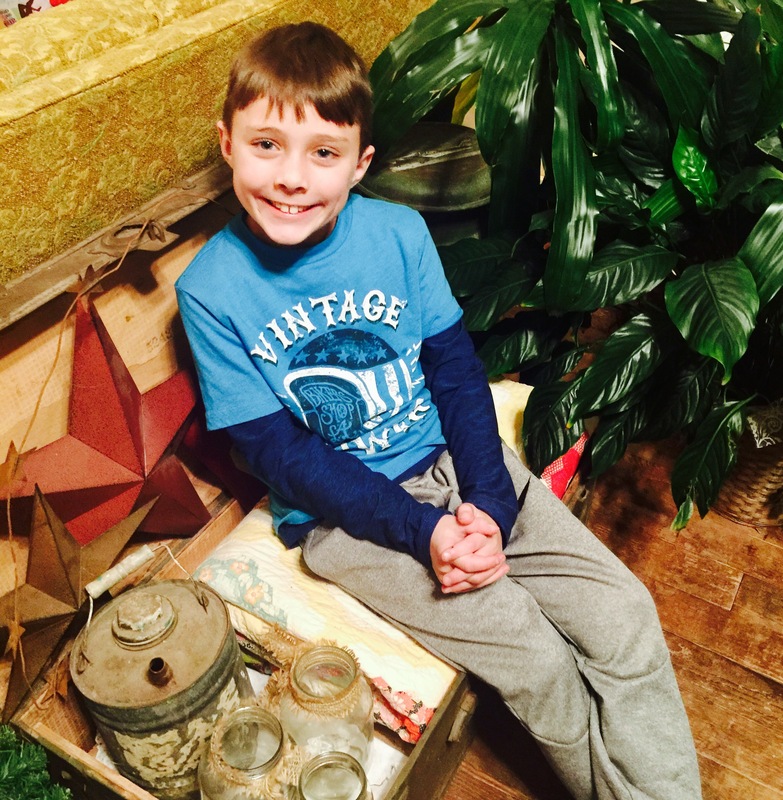 And most definitely Oliver can turn on the charm and dazzle people with his big smile. Or he can hold back, coolly appraising others or situations, weighing options before he acts. The section about holding things inside is true as well, something I’ve come to understand about Oliver recently. He is more shy and reserved than people at first realize. 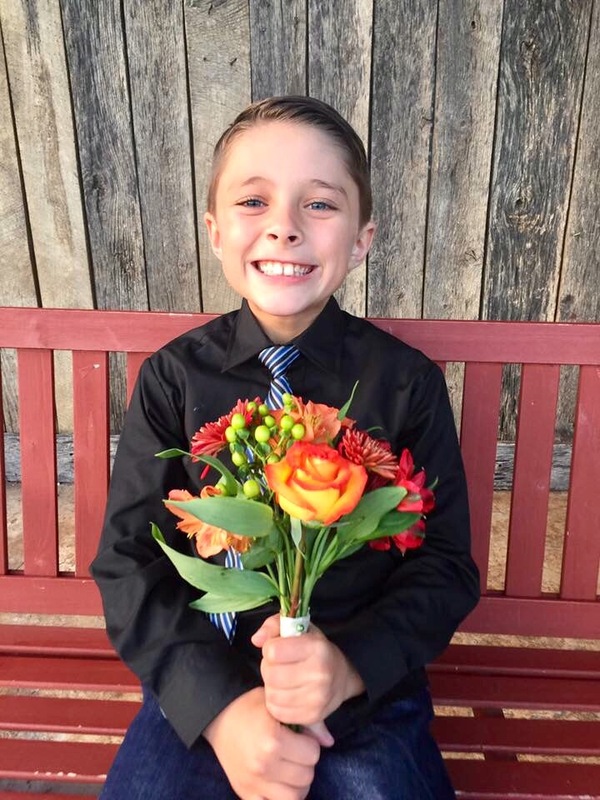 This sensitive boy has come to trust me, and with that trust, he has opened his beautiful heart and shared more about how he thinks and what he feels. New people, especially, or being in a crowd of strangers, can make him feel uncomfortable and less likely to engage with others. I appreciate Oliver’s honesty. When we are together, such as we were today, I don’t make him talk to people that he doesn’t know. If he wants to engage or answer a question a well meaning store associate or waitress asks, that’s totally up to him. I’m finding that if I will talk to the new person first, keeping a friendly and casual conversation going, Oliver is much more likely to join in on his own, and feel good about that. Everyone is unique. 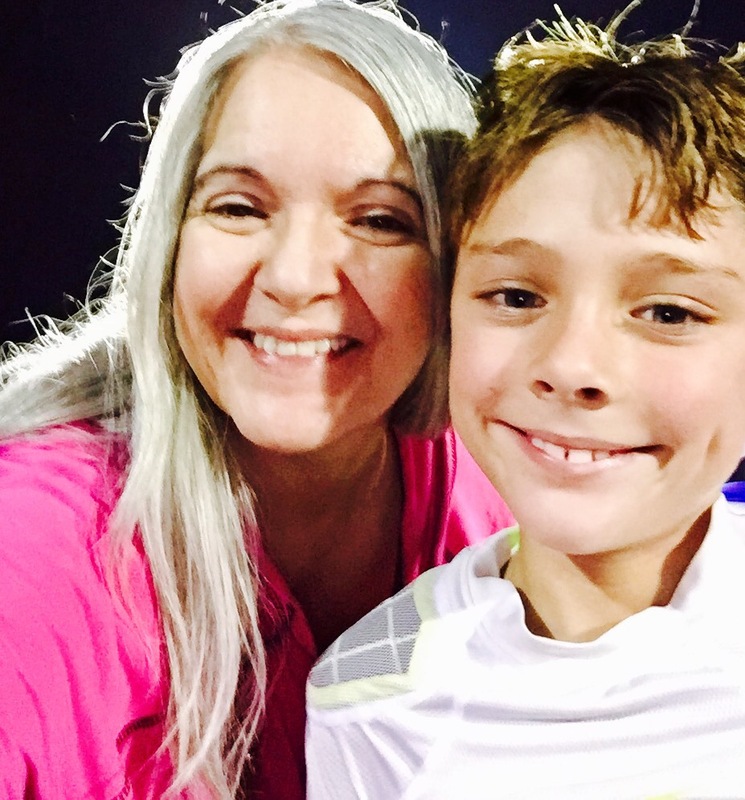 I’m grateful for this grandson’s perspectives and gifts and how he relates to the world. Today we enjoyed lunch at IHOP, where Oliver put away a stack of pancakes. We chatted about a broad range of topics. 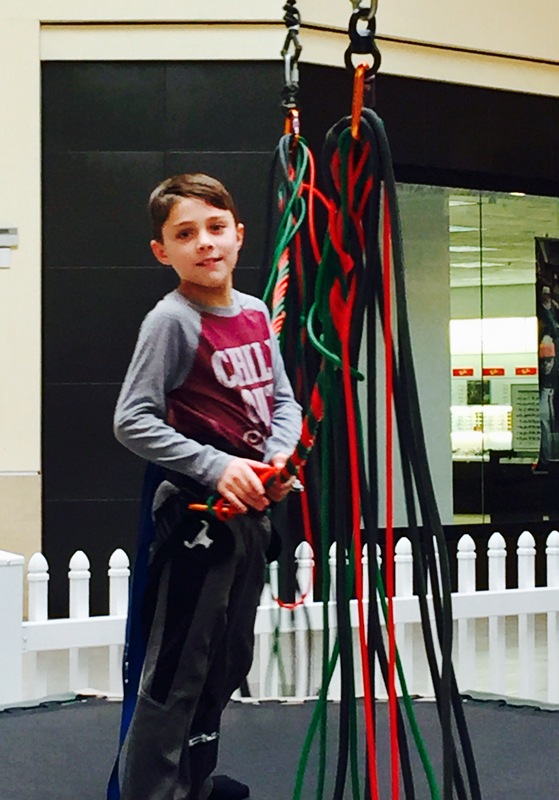 Rather than spend his birthday cash all on toys or on one big item, he asked if we could go to the mall. There is a place set up there, with cords and pulleys and trampolines, where the adventurous can bounce and somersault and leap high into the air. That’s what Oliver most wanted to do. And that is so like this energetic boy. He loves to move…run, climb, jump, do tricks…and he likes having an attentive and appreciative audience! Courageous, bold and action oriented all describe Oliver well. 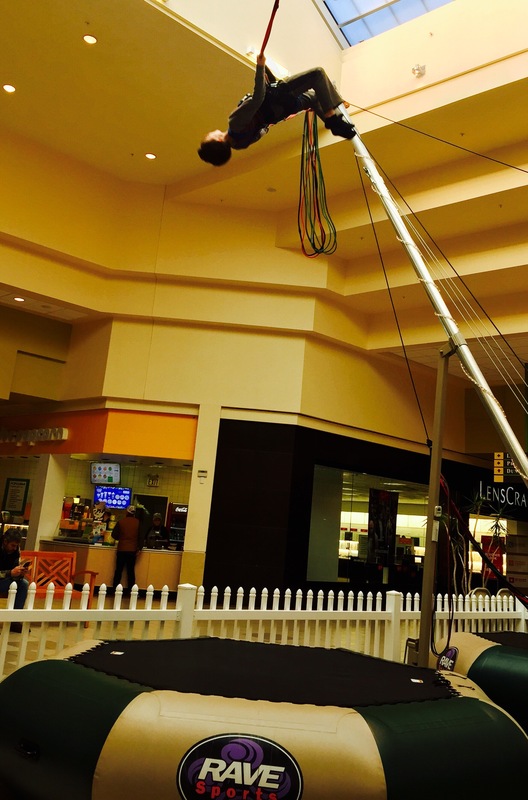 He used some of his birthday money to rig up and jump for 10 minutes, that infectious grin on his face, his athletic form spinning effortlessly into somersaults and back flips. I cheered and took pics and video, capturing his fun, capturing Oliver, and who he is at this moment. I have no doubt this boy will become a leader of others or a creator of big ideas. 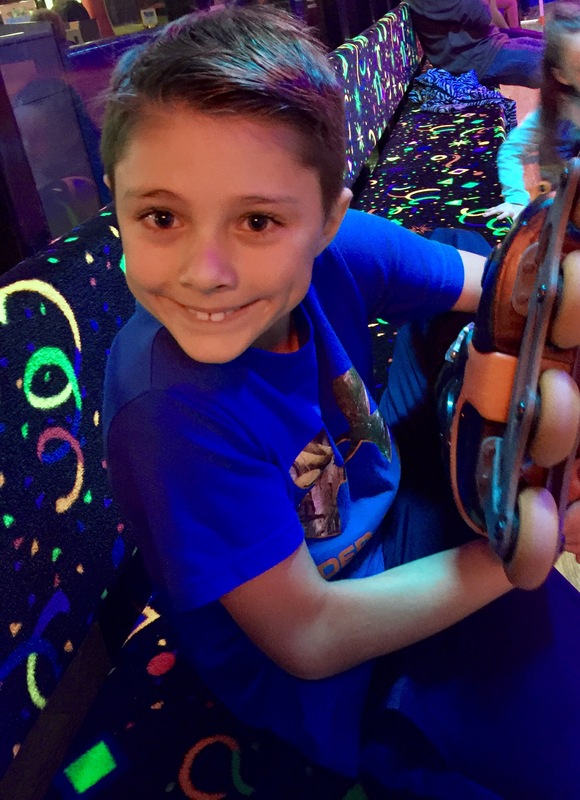 As I drove him home, he examined the one toy that he purchased at the mall…a hovering UFO type craft that is controlled with hand movements…and allowed his imagination to spark, thinking up possible inventions. Someday this kid, who is learning to channel his energy in remarkable ways, will come up with a million dollar idea that benefits many. I will enjoy seeing who he becomes and what he creates as he grows up. Happy birthday, Oliver. I love you so much!